From now until May 31, the Care Package Project is holding a fundraising campaign to send Girl Scout cookies to troops deployed overseas. You'll learn more about the campaign, as well as how to donate to this great cause, in the article below. 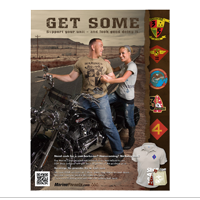 Speaking of great causes, here at Marine Parents we've recently launched an initiative to collect brand new, inspection-grade camouflage ("cami") blouses to send to the Liaison Office at Walter Reed National Military Medical Center for Purple Heart Ceremonies. Our second article has more information for anyone interested. 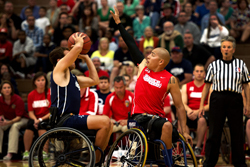 Our third article takes a look at the continued dominance of the Marines in the Warrior Games. 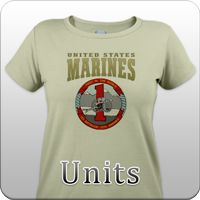 The Marines have now won the overall prize every year since the games' inception in 2010. Ooh-rah Marines! 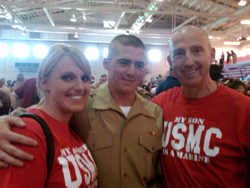 Finally, we take a look at this issue's Team Marine Parents Featured Participants--Jeff, Mike, and Jack, three friends who have joined forces to raise money, support the troops, and compete for bragging rights. 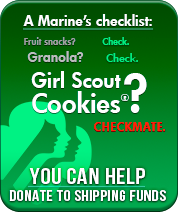 While our next official pack day may not be until late July, the Care Package Project has decided to hold an additional fundraising campaign for the month of May that will allow us to send Girl Scout Cookies to our troops deployed overseas. On June 6, local Girl Scouts will be coming to our facility from around the Columbia, MO area to help us pack 8,400 boxes of cookies into 840 care packages to be sent to troops in Afghanistan and Africa. (or girl power in this case). Now all we need are donations from you! All the cookies and volunteers in the world won't do us any good if we don't have a way to ship the packages overseas. To make this dream a reality, our goal is to raise the full amount it's going to cost for us to ship the cookies, about $12,000, by May 31. These cookies are not only a special treat for our troops, but they are also a comforting reminder of home. We appreciate your support! 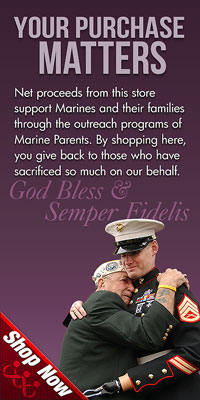 At MarineParents, supporting the troops in whatever way possible is our number one objective. So, when the Marine Liaison Office at Walter Reed National Military Medical Center (WRNMMC) identified a need for adapted cami blouses to allow Purple Heart recipients still in the hospital the dignity of being dressed in uniform for their Purple Heart award ceremony, MarineParents and our volunteers didn't hesitate to step in and help. After the blouses are collected, they will be sent to a seamstress who will modify them with Velcro (instead of buttons and zippers) so that they can easily be put on a patient who is confined to bed. Though it may not seem like much, having the chance to get dressed and be in uniform for the ceremony is something that will be greatly appreciated by our injured, ill, and wounded troops. If you are unable to send a cami blouse but would still like to contribute to this cause, you can click here to donate to Purple Heart Hero Support. 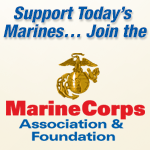 We will be using monetary donations to purchase Marine Corps chevrons to ensure that each Marine's "uniform" is as complete as possible. 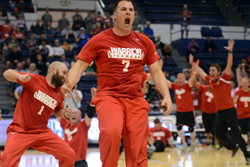 The 2013 Warrior Games, a paralympic-style sporting event for ill, injured, and wounded military personnel, concluded last week in Colorado Springs. The games pitted 260 athletes on 5 American teams (the Marines, the Army, the Air Force, Special Operations, and a joint Navy/Coastguard squad) and 1 British team (encompassing all branches of the British military) against one another in a variety of athletic events, including swimming, cycling, track and field, shooting, archery, wheelchair basketball, and sitting volleyball. For the fourth year in a row (the competition is only four years old), the Marines came out on top, holding off the Army to take home the ultimate prize--the Commander's Cup (or, as some have jokingly referred to it in recognition of the Marine Corps' continued dominance, the Commandant's Cup). The Marines finished with 93 medals and 100 points overall, well ahead second place Army's total of 81 medals and 85 points. This year's Warrior Games were the largest and most high-profile yet, with a number of distinguished attendees, including 5-time Olympic medalist Missy Franklin, Heisman Trophy winner and Olympic bobsledder Herschel Walker, Prince Harry of Wales, and, most notably (to us anyway), Purple Heart Hero Support-West Manager, Joyce Orrell. Additionally, the 260 athletes participating in this year's games was an all-time high. this issue's featured TMP™ team members. 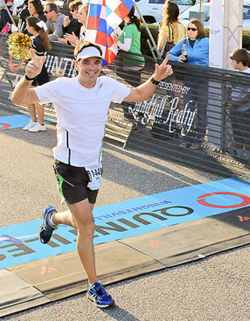 This month's members are a group of three friends who will be running in the Marine Corps Marathon this October--Jeff, Mike, and Jack. running together for less than two years, but all three are firmly dedicated to, and very excited about, being members of TMP. 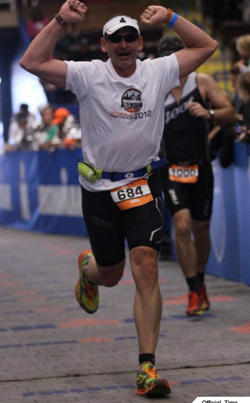 Jeff is running in support of his son, a Marine Lance Corporal. Mike and Jack don't have personal ties to the Marines, but both wanted to run for TMP not just to support Jeff and his son, but as a way to thank the men and women protecting our freedom around the world for the sacrifices they make daily on our behalf. it's no surprise that a friendly rivalry has been developing among the three of them. When October rolls around and it's time for the marathon, the competition will be to see who crosses the finish line first. Until then, the competition is focused on seeing who can raise the most money for Marine Parents outreach programs. As of now, Jeff has a commanding lead in that department, but, with your help and generous donations, there's still plenty of time left for Mike and Jack to stage a comeback.